And they're dancin' in our gardens. Low Growing Mounds of Delicious Blue Blooms. Keep them moist and they'll dance all Summer long. 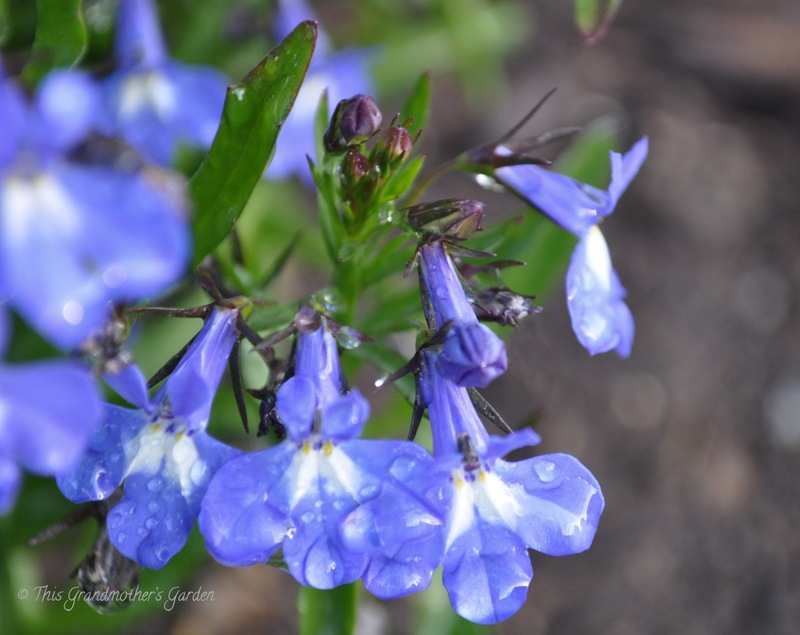 Just can't get enough Lobelia. always a star in our gardens. Although they just may visit if you plant this little beauty. 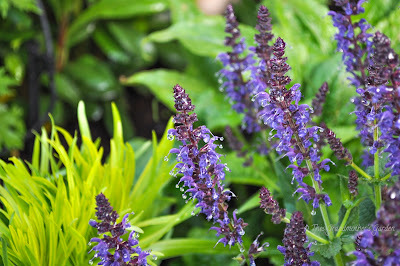 This Salvia is an annual in my Zone 5 gardens. over those sweet blue blooms! with very little attention from the gardener. But once it blooms... it's a real show stopper! I have always loved Delphiniums. 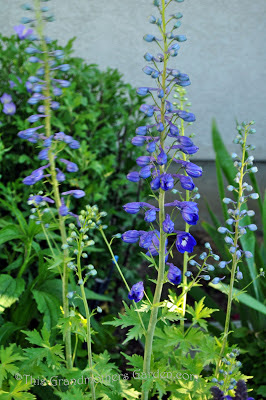 I have nurtured delphiniums in my gardens. They belong to my heart. I love your posts! Your blue flowers are gorgeous. What a difference a few weeks makes in the garden - from covered with snow to bursting with bloom. It's a miraculous thing! It really is miraculous... isn't nature wonderful? Gorgeous blooms and photos. 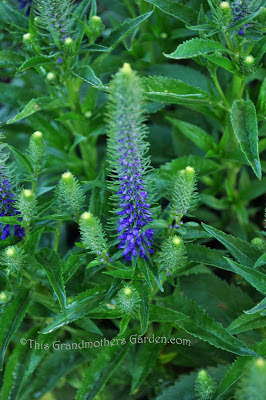 We just added some speedwell plants to our garden and love them. Thank you, Donna. 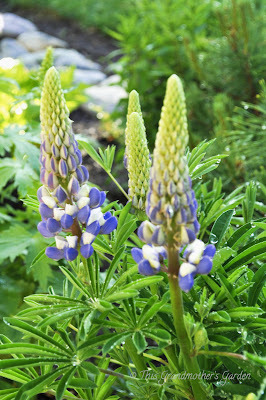 I added them to our gardens several years ago and I'm so glad I did! Beautiful choice of blues. Fantastic shot you caught with the Hummingbird. You must have lots of patience to wait to get a shot like that. Thank you, Meggie. So glad that you visited today. 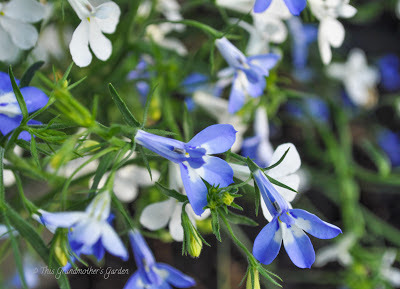 I grow lobelia white and blue from seeds. It's hard work, because the seedling are very tiny and weak. 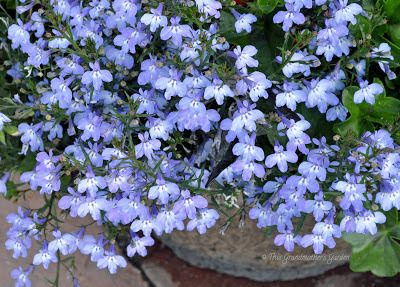 Then my lobelias have been planted in pots and start blooming. Nice shots! Nice bright color as blue sky! I'm quite sure I wouldn't have the patience to plant them from seed. Kudos to you Nadezda. They ARE blue like the sky, I think that's why I enjoy them so much. Blue blooms are a stand out in my garden and I have many of the same...of course I love blue lobelias in the summer the best! I'm thinking we are kindred spirits, Donna. We are alike in so many ways. Enjoy your blues! Just gorgeous! 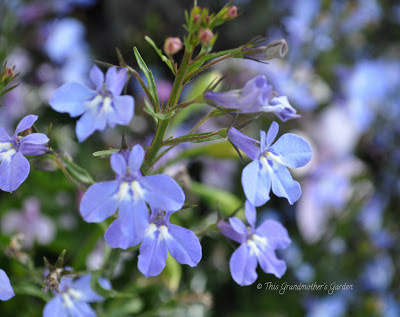 I love the lobelia! 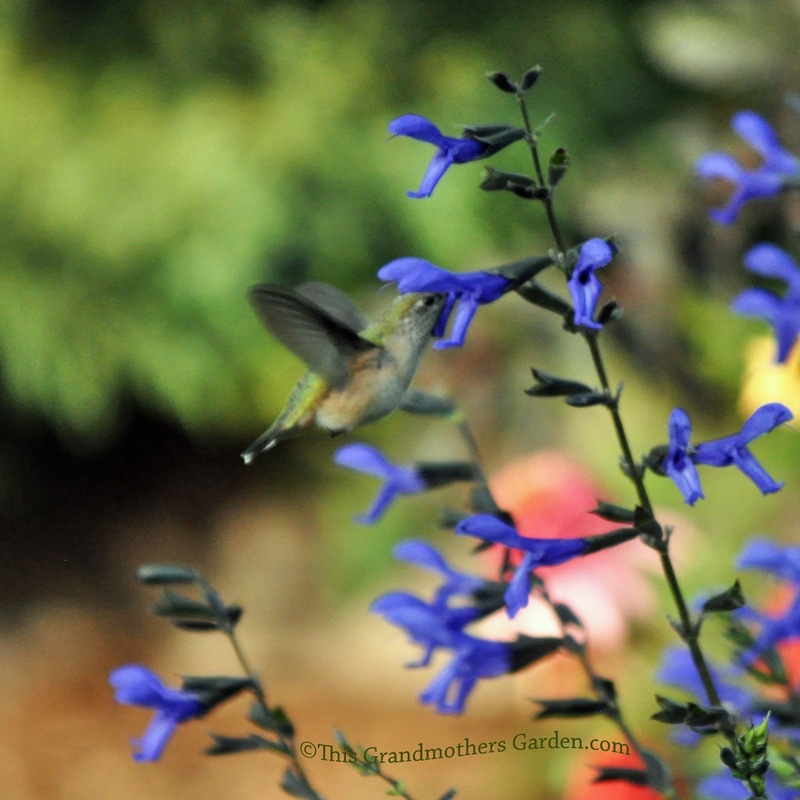 I had a large patch of 'Black and Blue' Salvia at my last garden, but I never saw hummingbirds around it (though they were rather far away from the house so maybe I just missed seeing them). How fun you get to watch the hummingbirds there! I never saw them until late in the season last year... too busy, busy. 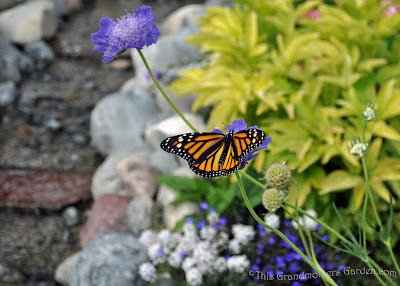 I've promised myself that I will spend more time simply enjoying my gardens this year. I would love to plant Delphiniums...must remember. I remember that you love blues, Jen. I always enjoyed you Bluoom blog. Your blues are wonderful and your photos are just beautiful. I must go out and find some lobelia for my garden. Thanks for the inspiration. 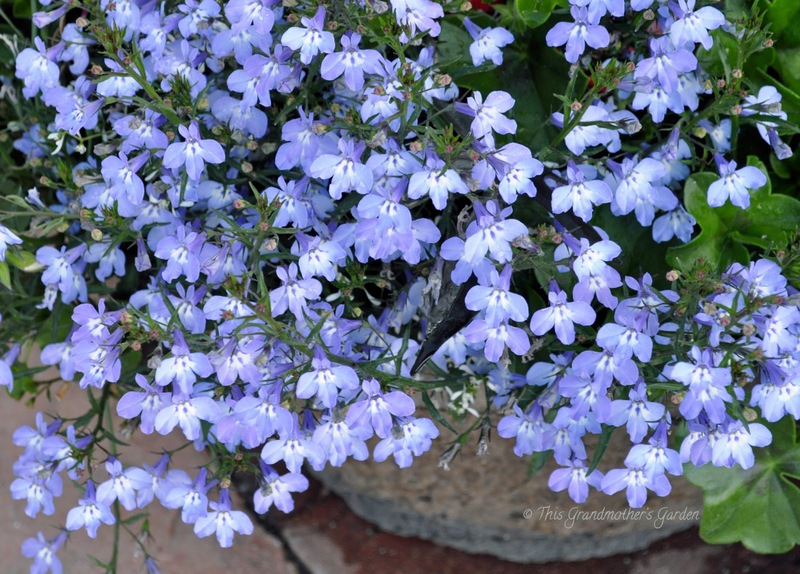 There are actually more lobelia colors than blue that you may enjoy... but my heart belongs to blue. I just bought some Salvia 'Black and Blue'. I love the picture of the hummingbird feeding on this plant! Oh I hope the hummingbirds find you! I share with you some of these fabulous blues, now, can you send me over some Hummingbirds. Oh that I could Alistair! Thank you Michelle, I'll try to remember to visit on Tuesday. 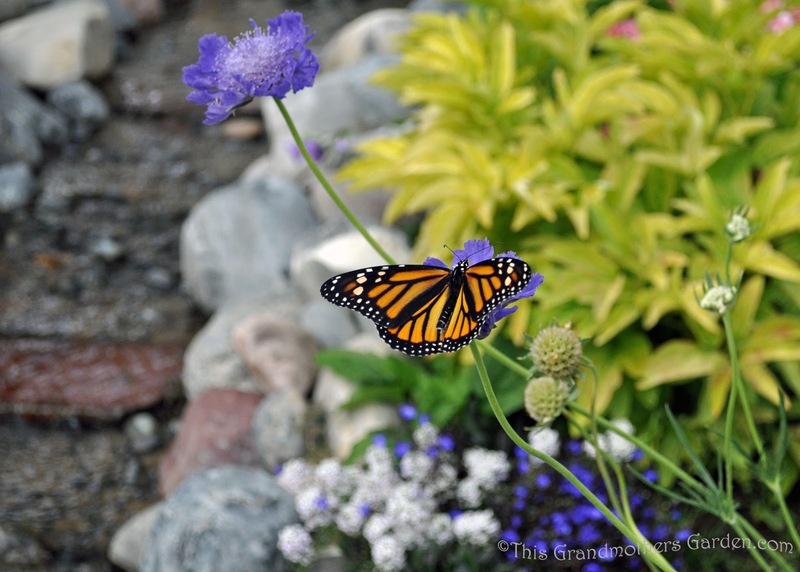 Sadly, Monarchs are very few in number here, but I'm hoping my efforts will change that.